In a post-Mast Brothers world, East Bay bean-to-bar chocolate makers win converts, one bittersweet bar at a time. 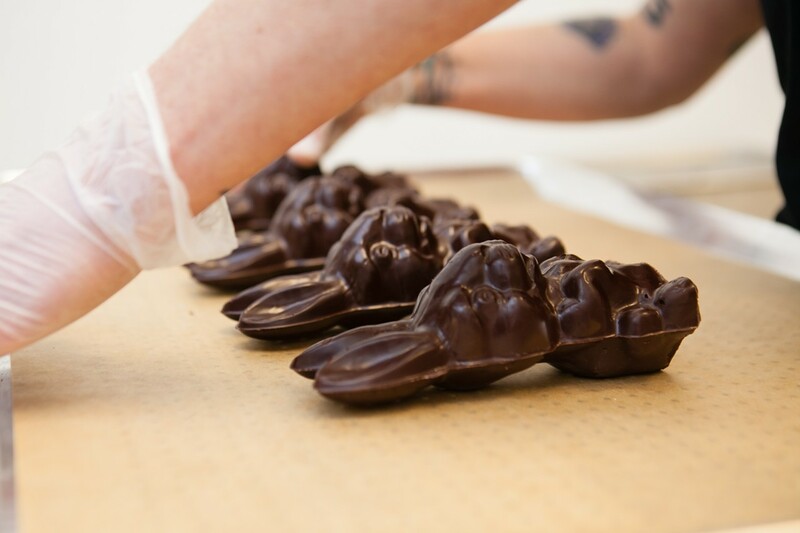 At Berkeley's Bisou Chocolate, making bean-to-bar chocolate is a difficult, labor-intensive process. One of last year's biggest food scandals centered on a pair of bearded brothers from Brooklyn who marketed their popular Mast Brothers chocolate bars as scratch-made, "bean-to-bar" chocolate, when, as it turned out, at least some of it was actually made by the French chocolate manufacturer Valrhona, and the brothers had simply remelted it. It was a case of schadenfreude heard 'round the world. Even distant observers relished the details of the takedown published by DallasFood.org — the thick beards and Amish-style wardrobe favored by proprietors Rick and Michael Mast; the chocolate bars' luxurious wrapping paper and $10 price tag; and the fact that, in the opinion of many internet pilers-on, the chocolate wasn't any good to begin with. If you were the kind of person who believes the very existence of a $10 chocolate bar was illustrative of the folly of the One Percent, here was proof. If you were someone with strong opinions about bearded hipsters — well, what else needed to be said? But the Mast Brothers controversy also pointed to a larger truth: Many of us just don't know very much about chocolate. The East Bay is home to a handful of bean-to-bar chocolate companies, which run the gamut from national brands like TCHO, which recently moved its manufacturing facility to Berkeley, to scrappy operations such as Bisou Chocolate and Oakland Chocolate Company, both of which make chocolate bars in such small batches that you're unlikely to find them outside the confines of a local farmers' market. But while you can scarcely walk into a coffee shop in Oakland or Berkeley without a stranger offering an unsolicited opinion about roasting level or pour-over methodology, even a true food obsessive might be hard-pressed to explain what "winnowing" is, from a chocolate-making perspective, or to name even a single cacao varietal. Part of the problem is that the bean-to-bar movement is still too new for it to have penetrated the public consciousness, explained Eli Curtis, who co-owns Bisou Chocolate along with his partner Tracey Britton. Of course, the history of chocolate goes back thousands of years, to the ancient Aztecs. But for much of this past century, almost all of the world's chocolate has been produced by giant companies using automated, industrialized processes — chocolate "made by robots," as Curtis put it. 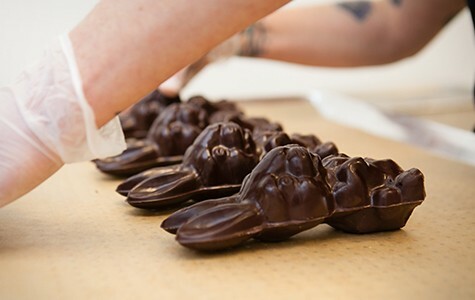 In 2006, when Curtis and Britton first started making chocolate, there was just a small community of people in the United States who were experimenting with making artisan chocolate, using makeshift equipment and techniques that they read about in online forums. "Other foods had grown in the craft sector, but chocolate had remained this secret, unknown process," Curtis said. The term "bean to bar" refers to chocolate makers who oversee the entire process of making chocolate — sourcing the cacao beans from overseas, roasting them, winnowing them (removing the husks), grinding the nibs (the inside of the bean) into a liquid, and then crystallizing that liquid to create a shelf-stable product. It's a difficult, labor-intensive process that many have likened to alchemy. And the resulting chocolate tends to be more distinctive-tasting, yielding layers of flavors that can be as complex and wonderful as fine wine. This stands in contrast to giant companies like Hershey's, whose milk chocolate bar has only, as Curtis points out, "11 percent cacao in it — and it's all really bad cacao." But, as with coffee, the reality is that a lot of people like mass-produced, commercial brand chocolate — just as they like Starbucks coffee. For example, a "Safeway Select" dark chocolate bar, which claimed no bean-to-bar pedigree, did surprisingly well in a recent blind tasting at the Express office. As for the extent to which the products are individually hand-crafted, there's no comparison. 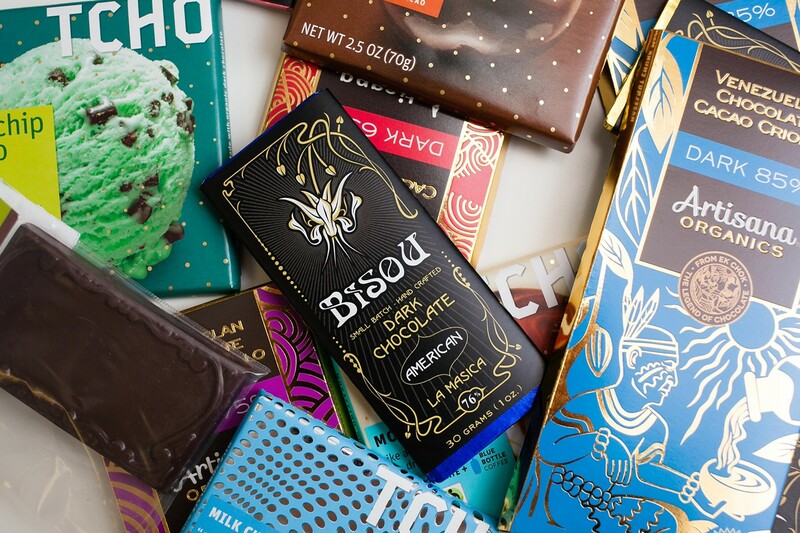 Curtis and Britton, who were bike messengers in San Francisco before chocolate became their raison d'être, are Bisou's only two employees, and they work long hours to produce a relatively modest amount of chocolate — maybe two hundred pounds a month, most of it sold at farmers' markets. Meanwhile, proprietor Nancy Nadel believes the Oakland Chocolate Company might be one of the smallest bean-to-bar businesses in the country, with an average output of just twenty pounds a week. In an interview, Nadel said she didn't start making chocolate until she was in her sixties, while she was a member of the Oakland City Council. She used to share the chocolate that she made with her colleagues. "They seemed to like my chocolate more than progressive policy," Nadel quipped. Now retired from public office, Nadel has turned her chocolate hobby into a full-time business, which she operates out of a small workshop in West Oakland. The other unique thing about her chocolate: While most chocolate companies — even small, bean-to-bar operations — source their cacao from multiple countries, all of Nadel's beans come from Jamaican farmers, whom she first met during a family vacation in 2006. During that first visit, the farmers had told her how difficult it was for them to get a good price in the commodity chocolate market, and she was inspired to see if she could help them. TCHO stands out among the East Bay's bean-to-bar companies both in scale and prominence. While the company was reluctant to release exact numbers, it's safe to say that its annual output is more easily measured in tons than pounds. (For instance, the machine the company uses to grind cacao can handle three tons of beans in a single batch, as opposed to the 25-kilogram-capacity grinders used by a lot of smaller operations.) TCHO also touts its tech-driven approach — what the company's marketing materials describe as "Silicon Valley start-up meets San Francisco food culture." The website is dotted with terms like "2.0," "Beta," and "Cropster." One of the advantages of scaling up the bean-to-bar approach in the way that TCHO has is that it has the potential to have a larger impact on the global chocolate market. The aforementioned "Cropster," for instance, is a cloud-based database that allows farmers to track when the cacao beans should be picked in order achieve the flavor profile that TCHO is looking for. This leads to fewer beans being rejected and, ultimately, farmers making more money. None of the chocolate makers I spoke with seemed particularly fazed by the recent Mast Brothers scandal. In fact, a few argued that the controversy was actually good for the burgeoning craft chocolate industry. As Bisou's Britton put it, "I think it helped to raise awareness for the general populace." And despite all of the snarky internet commentary about $10 chocolate, Curtis pointed out that even the world's very best chocolate bars typically won't cost you much more than $15. In that sense, chocolate is one of the world's most affordable luxuries, Curtis said. "This is the golden age of fine chocolate." Though some tasters found this high-cacao bar to be too bitter, I enjoyed the bar's earthiness and its pronounced — but pleasant — bitter, toasty flavor. The chocolate is very soft and very smooth. Buy at: SmallBatchChocolate.com, various farmers' markets (including the Saturday Alameda farmers' market), and a small number of retail shops such as Sacred Wheel Cheese. None of Oakland Chocolate Company's chocolate bars contain any vanilla. That fact, along with its very high cacao content, made this particular bar a divisive pick. While some tasters found the chocolate to be bland, I admired its toasty, roasted-nut quality, which complemented the inclusion of actual almonds. Here, you're really tasting the cacao, and there was an almost boozy undercurrent of flavor that I found fascinating. Buy at: TheOaklandChocolateCo.com and at the Old Oakland Friday farmers' market. This single-origin bar is part of TCHO's original line of chocolate bars. This was fairly sweet compared to the higher-cacao bars we sampled, but compulsively snackable, with a hint of raspberry on the finish. Buy at: TCHO.com or at any number of supermarkets. Artisana, an Oakland-based producer of organic nut butters, also sells a line of chocolate bars made with organic Criollo cacao beans grown on one of the owners' family farm in Venezuela — though the chocolate-making process itself takes place in Switzerland. Artisana's 75-percent bar — the company's middle-of-the-road option in terms of cacao content — received high marks for its mellow, balanced sweetness, and for the chocolate's smooth texture as it melted, easily, on the tongue. A solid choice for those who like commercial dark chocolate but are looking for something of a higher quality. Buy at: Berkeley Bowl and Alameda Natural Grocery.